Mugi Takei was born in New York and moved to Japan when her parents decided to return to their homeland. She studied painting at Massachusetts College of Art, and received her MFA from Cranbrook Academy of Art. In 2001, she traveled to Brussels, Belgium to study French, Russian history and philosophy. Two years later she moved to Kuala Lumpur, Malaysia, to live with her mother, and organize an independent film festival in support of young Japanese filmmakers and to develop cultural exchange. She served as teaching artist at the Wing Luke Museum of the Asian Pacific American Experience in Seattle, where her art is represented by Cullom Gallery. 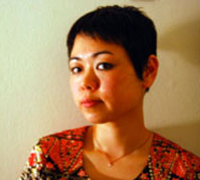 Mugi Takei is the artist for the anthology, Dirty : Dirty.